Housewarming gift for us becomes housewarming gift for you. Good folks at allmodern.com offered housewarming gift to warm Atomic Indy abode. Flattered, we searched. Became highly impressed with each progressive click. 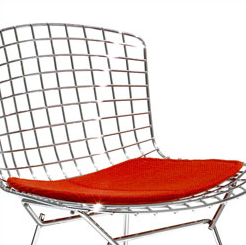 They carry officially licensed products from Knoll, Herman Miller, Kartell, Vitra and more. Deep selection offered at fair prices. Upon realizing we’d lost an hour drooling on their site, we accepted housewarming offer – with a twist. Why should we have all the fun just because we author a blog? You’ve traversed this journey with us. Provided encouragement through our cruxes. Aided in navigating us to an orange-backed kitchen island. For this partnership we thank you. Faithfully. It takes a village. Act of appreciation manifests itself into a housewarming pay-it-forward. For one of you. We were told to select any delectable modern delight on allmodern.com with a ceiling of $200. At first thought you might convince yourself this is impossible. Prior to loss of aforementioned hour, we would have agreed. We were proven wrong. There's a lot more to choose from. Leaving remaining mid century modern object hunting to you. Hop on allmodern.com. Recommend starting with Knoll. Search for items under $200. Narrow it to one. Post a comment with link to said item. Feel free to Tweet it to @atomicindy or Facebook it on Atomic Indy Facebook page to increase chances. Names will be dropped into a proverbial hat. One week hence a name will be drawn from proverbial hat. Item selected by winner will be sent courtesy of allmodern.com. Don’t post comments anonymously. We kind of need to know who you are. Let the housewarming begin. What mid century modern goodness do you want? As a quick follow up to Atomic Crash Party. Many thanks for interest and support. Appears we have enough host homes to make it through year one. Debut Crash Party is on for July 18th, 2009 1pm-5pm. Mark it. Ladies, get your party dresses ready. Details forth coming on next post. Renovation progress has slowed slightly with W. Lafayette home tour and yard sailing. Ahoy. That said, we do have a few renovation projects to reveal. Stand by. What an awesome contest. I fell in love with this hanging lighting fixture, and it totally matches the colors in my room so I hope hope hope I win. Baz -- You are too kind! I like the Kartell Componibili, almost went with the Vitra Elephant Stool, but this Lamps 2 Light Table Lamp is my pick (despite its rather generic name). 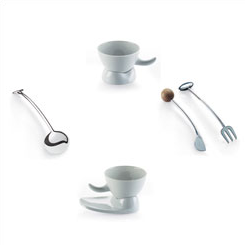 I'd get the Alessi Wood Pepper Mill by Peter Zumthor - it would look perfect in the kitchen at Beach House and when else could I afford $165 for a pepper mill I've coveted for so long? 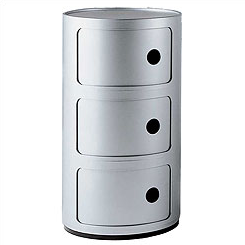 No question, the Kartell Round Tower storage unit. It makes me feel like a hot YOUNG designer again! You guys are finding some great stuff. Stuff I didn't even know they had. It's cool to see people's taste too. Wow, great contest! I've never been to AllModern before - they sure do have a lot to choose from. My heart lies with the George Kovacs Seven Bulb Table Lamp - I'd have to buy another if I won this one to make a nice pair of bedside lamps. Plus, it matches the chrome sputnik chandelier in my dining room. Lovely stuff! I'm a fan of http://www.allmodern.com/Offi-PD2265-Black-OFF1114.html. Something to move media from a thing to store, to a thing to display. Thank you, Baz, for a great contest. What a great website. I love the cute little Herman Miller wire base table with the ash top and the zinc-plated base. Have another one with a black top and it's great. Thanks for sharing: http://www.allmodern.com/Emu-ER125-EMU1003.html. For now, we'll just have to take turns sitting in the chair. Great contest! Thanks for putting it on. What a great contest! I love this chrome and black George Kovacs table lamp! In the off chance that I find some luck in that proverbial hat, I would like the Blu Dot Real Good Chair in Aqua with the optional seat pad in White, if I may. :D Thanks, Baz! The colors, the style, the functionality all integrate in mi su case a la Garfield Park. Note the similarities to this style and my twitter wallpaper. Coincidence - NOT! Cheers! Clinking Martini glass to Mojito glass! I've always admired the look of the Componibili Round Tower. It'll suit well in my new house! Gotta play this game...I'm wishing for the Kartel 3 level round storage unit in white. My son loves playing with it when we see it in any store & it would look great in our house. The chocolate on green is nice, probably in 14"x16" swag to fill the space over the breakfast table we dont have! I adore this Artemide - Spiral Wall Light. Great stuff from everyone. Blown away by the variety of selections and the fact that you guys found stuff I didn't even know http://allmodern.com had. I'm pumped that you're all getting into it. Spread the word. My 60's house definitely needs the Le Klint LK47 - LK47 Pendant Lamp! which are relatively cheap so I'd get a set of 6 for me in olive and a set of 6 for you (I think you'd need the orange). I know I was supposed to pick one item so maybe I don't even qualify. Anyway, fun contest and congrats on all those terrific things you found at the yard sales, you all really scored. I think I might go with this steelcase chair to accompany the steelcase desk that's living in my garage waiting for restoration. Just can't decide which color I want the most. What a great contest! And I love your blog, too. I found you from The Design File. I'd love to be original, but I'm gonna hop on the Hang-It-All train. I've wanted one for a long time. Sweet contest Baz. Like someone else who has already posted, I dig the Herman Miller Eames Wire Base Table http://www.allmodern.com/Herman-Miller-%AE-LTRT-HML1167.html. Have bookmarked allmodern.com and will be coming back. Great site. 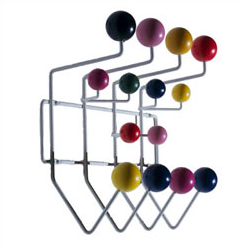 If you like the Hang-it-all there is a limited edition with solid walnut hooks in the style of Charles Eames Hang-it-all.